The course will be well marked with directional markers, flags, and two solid white lines, as appropriate. Flags will help mark turns on the course. There will also be race marshals throughout the course providing directions to the runners. Teams may enter up to 12 athletes in the varsity races. There will be unlimited entries in the Open Race. Teams do not have to designate a top 12 with the team entry. Please submit entries to directathletics.com by 11:59 p.m. Tuesday, October 23, 2018. You may enter your roster at any time and update it as necessary throughout the season. Please print a copy of your final entries for confirmation. The entry fee is $12 per varsity athlete (a maximum of $144 per gender team if entering a full 12 person team). Entries should be paid at the packet pick-up prior to the meet. Please make your checks payable to: Haverford College. Receipts will be available for all teams after payment, if needed. The will be a Centennial Conference Cross Country Championship conference call for all coaches and administrators on Monday, October 22 at 2 p.m. Team packets will be available for pickup on Saturday, October 27, 2018, beginning at 9 a.m. at the tent by the start/finish line. 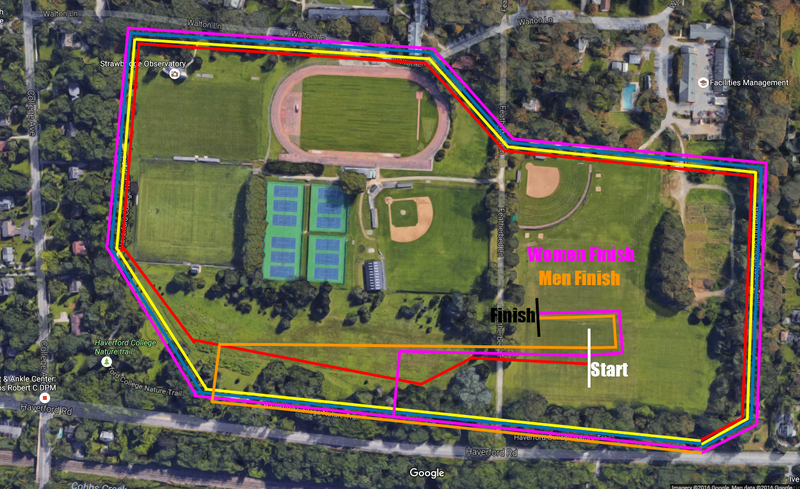 There will be a brief coaches' meeting at 10 a.m. at the starting line. In case of inclement weather, the coaches' meeting will occur inside Alumni Field House. Timing services will be provided by Motion Timing, Inc. Assigned race numbers must be worn by all participating athletes on the front of their uniforms. Electronic bar-code bib tags will be affixed to the race numbers, and all athletes must wear these tags in order to be included in race results. The awards ceremony will begin after the open race at approximately 1:30 p.m. and will be held near the main tent. In case of inclement weather, the ceremony will be inside Alumni Field House. Awards in each race will be as follows: medals to places 1–7 (first-team all-conference) and places 8–14 (second-team all-conference). The winner of each championship race will be named the Centennial Conference 2018 Runner of the Year. There will be no awards for the Open race. In case of inclement weather, student-athletes and coaches may use Alumni Field House. Please be prepared to deal with adverse weather conditions. In the case of lightning or other severe weather in the area, the course officials and administrators will follow the recommended procedures for the NCAA Championship. Haverford Athletics requires all competitions to cease if lightning is within a 10 mile radius of the event. All teams competing in the Centennial Conference Cross Country Championship may review the course on Friday, October 26, 2018, from 1 p.m. to 5 p.m. If you are intending to preview the course, please contact Melynda Link, at 610-896-1125 or mlink@haverford.edu, with your estimated time of arrival. All visitors must park in the visitor lot. Buses can drop teams off in the South Parking Lot at the south entrance to the Gardner Integrated Athletic Center. Please refer to the campus map for location of these parking lots and the athletic center. Teams are welcome to use the visitor's locker room on the lower level of the Gardner Integrated Athletic Center (GIAC). Access information will be included within coaches' packet. Participants can enter the lower level of the building to gain access to the Athletic Training Room and Locker Rooms (if needed). Haverford College is not responsible for any items left in locker rooms. There will be one locker room for male athletes and one locker room for female athletes. Restroom facilities will be available in Alumni Fieldhouse and the GIAC. In addition, several port-a-john facilities will be available on Featherbed Field. Curt Mauger (610-896-1425) of Haverford College will serve as the official athletic trainer for the championship. Teams with special needs should contact him as soon as possible to make necessary arrangements. An area for athletic trainers will be set up at the main tent on Featherbed Field near the start/finish line(s). Water and ice will be provided at the competition site. Complete individual and team results will be distributed to all Centennial Conference SIDs by Haverford College SID, Justin Grube (610-896-1042; jgrube@haverford.edu) as soon as possible after they are declared official following the conclusion of each race. Sports information directors with additional needs should forward those requests to Justin. Please view the Visitor's Guide page on the Haverford College website for information regarding directions to the College, a campus map, hotel information, and local restaurants. Fairfield Inn on Rt. 3. - 10 rooms are provided to any group looking to stay at the hotel. The group has until 30 days prior to arrival to fill the 10 rooms. More rooms will not be given until the initial block is filled. Discounted rate of $159 plus tax per room per night. Admission will not be charged for this event.